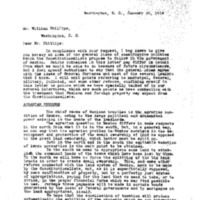 Luis Cabrera writes to William Phillips about the situation in Mexic. In compliance with your request, I beg leave to give you hereby an idea of the general lines of constructive policies which the Constitutionalists propose to follow in the government of Mexico. Points contained in this letter may differ in detail from what we would be able to do because of future circumstances, but I feel myself authorized to say that the general lines agree with the ideas of General Carranza and most of the several leaders that I know. I will omit points referring to municipal, federal, military, judicial, and some other reforms, confining myself in this letter to points which we have specially talked of in our several interviews, which are such points as have connection with the treatment that Mexican and foreign property may expect from the Constitutionalists. The chief cause of Mexican troubles is the agrarian condition of Mexico, owing to the large political and economical power existing in the hands of the landlords. The agrarian question in Mexico differs in some respects in the north from what it is in the south, but, in a general way, we can say that the agrarian problem in Mexico consists in the development and protection of the small ownership of land as opposed to the great land ownership, which latter must be split up. Both in the north and in the south the equitable taxation of large properties is the main point to be obtained. In the south we mean to appropriate some land to establish the communal lands of the towns which have been lost by them. In the north we will have to force the splitting of the big land tracts in order to create small ownership. This, and some other reforms connected with the land system of Mexico, have to be made by the Constitutionalists, not, as it is superficially supposed, by mere confiscation of property, but by a perfectly just system of appropriations, paying for the land that we need to take, or to divide, in the proper financial forms which we may find possible to use. Perhaps these payments will be made in certain bonds guaranteed by the local or federal governments and by mortgages on the land appropriated, itself. We hope that the equalization of taxation will produce automatically the splitting of the property which we are attempting to obtain. The banking institutions existing in Mexico, and chiefly the state local banks and the central organ, called Banco Central, have been working from their beginnings on the basis of banking monoply and official protection. Experience has taught us that most of the credit institutions existing in Mexico have not contributed to develop the credit, but have been employed simply as instruments to enrich their managers and directors. Most of the banking concessions need a complete revision and to be thoroughly changed in order to reorganize banks on a more businesslike and just basis so that they will really fulfill their functions in regard to the credit of the country. All the reforms which have to be made in our banking institutions will require, no doubt, some radical measures, which will be taken, always within the legal forms and with the necessary respect for the interests already invested in such banks. In my yesterday’s letter, I told you that the Constitutionalists have not received, and are not willing to receive, any help from foreign concerns. The Constitutionalists have been living on funds raised within the country. For sometime still they will have to resort to the resources of the country until we have time to resort to foreign credit, which we do not expect to have until we are better known and the first steps of the Constitutionalists in government matters are known. We consider it still necessary to raise money with some prudence from such sources as are considered more resistent, such as rubber, oil, henequen, silver, cattle, etc. At the same time, we are using, and we will have to use for sometime, the paper money which we have issued in order to facilitate the circulation and to distribute in a more equitable form our war contributions. In this matter we have been, and expect to be, very careful in order to avoid the very well known consequences of abuses from this system. The majority of the most important lines in Mexico are included in the merger known under the name of the “ National Railways of Mexico, " under the so-called control of the Mexican government. We can say that, outside of the Southern Pacific, the Tehuantepec, the Vera Cruz lines, the rest of the railways of Mexico are included in the National Railway system. This has created practically a railroad monopoly, which was tolerated because of the theoretical control of the Mexican government. Since that system has proved to be a real failure as a control, the Mexican government has to decide whether to establish a real system of government ownership of railways, and, in case this is not possible, will have to abandon frankly the policy of railroad control, but doing this in such a careful way that the railroad monopoly, which has been created through the merging of the national railways, would not subsist in the future, with danger to the rest of the non-merged lines. In case the Mexican government changes its railway policies, we will need at the same time to revise our railway laws in order to reach a proper system of relations between the government and the railway lines. We are convinced that most of the attempts made by Huerta to place loans in Europe had, as their real purpose, the supporting of his dictatorship and fighting the revolutionists. This is the reason why those loans are looked upon by the Constitutionalists most unfriendlily. Huerta obtained, in France, principally, $30,000,000, more or less, of which $20,000,000 was applied to cover some preexisting Mexican debts. The remainder of the money was spent by Huerta’s government. We can not say how much of that money was really used for the benefit of the dictatorial system of Huerta. The Constitutionalists are willing to recognize and pay such moneys as have been converted to the benefit of the country. Perhpaps this policy will have to be reconsidered later, if we have to resort to foreign, and perhaps European, lenders. We are willing to pay what is just, and perhaps a little more than what is just, for the sake of the credit of our country in foreign money markets. The Constitutionalists are entirely ready to pay all the forced loans placed uopn Mexicans and foreigners during the war. But with regard to loans exacted by Huerta, the Constitutionalists must be very careful so as to distinguish the real forced loans from certain money help made in a quite spontaneous and willing way, with the clear purpose of supporting Huerta’s dictatotial government. For this purpose investigation commissions will surely have to be created. It is not a general practice to pay the damages caused by a civil war, but Mexico is in a condition where she needs to give a certain guarantee to the investors in the country, and the Constituionalists are willing to follow the rule established by Madero to indemnify for war damages caused to foreign and Mexican people. The Constitutionalists do not mean, however, that these damages would be paid without a careful investigation of every case presented. For this purpose investigation and settling commissions will be created in order to handle this matter in a way just and equitable both to the claimants and to the Mexican government itself. High rates of profits in business do not go along with secure investments. Most of the foreign investments in Mexico have obtained very high profits in time of peace, and, by the hereby stated policy, they would have protection against the risks of war. It seems, then, natural that people who have suffered damages from the war would not expect their claims to be paid in cash, buth through some special issue of bonds. The Constitutionalists could simply follow the rule of declaring void and null any concession or contract made by Huerta. But we have to take into consideration that some of those contracts might have been made within the law and in good faith, and some of them perhaps ought to be made by any government which would exist in Mexico. It will be necessary, then, to establish certain rules to revise concessions and contracts made by Huerta in order to decide which of them have to stand and which have to be considered void. I hope that this brief statement will help you to get an idea of the constructive policies of the Constitutionalists. I have purposely avoided entering into detailed developments which would be of doubtful acceptance by the leaders of the Revolution, but if my personal opinion on any of these subjects is of any use to you, I am willing to give you further information on the matter. Cabrero Lobato, José Luis, “Luis Cabrera to William Phillips,” 1914 January 28, WWP18318, First Year Wilson Papers, Woodrow Wilson Presidential Library & Museum, Staunton, Virginia.